With so many people of Mexican descent in the Phoenix area, it's no wonder that Cinco de Mayo is a day much anticipated in the Valley of the Sun. Cinco de Mayo means "fifth of May" in Spanish. It's a day for fun, and food, and music, and dancing. Many people mistakenly believe that Cinco de Mayo (seen-koh day my-oh) is Mexican Independence Day, but it is not. Mexican Independence Day is September 16th. Cinco de Mayo is a national holiday in Mexico commemorating the Battle of Puebla. On May 5, 1862 a small group of Mexican soldiers defeated a formidable French army that was twice its size. Mexico had long before (September 16, 1810) declared its independence, but there were constant struggles to maintain Mexico's freedom for a long time after the country became independent from Spanish rule. Cinco de Mayo is a celebration of the fortitude of the Mexican people. I update this page right up until Cinco de Mayo, so check back for more celebrations around town. These are presented in date order. You can plan to attend several! The newly-remodeled location on the southeast corner of Scottsdale and McKellips Roads in Tempe will host a special grand opening fiesta. Get a first-hand look at the recently-remodeled store. Shop for groceries, enjoy food samples, enter to win giveaways, and take in live performances from mariachi singers. The fiesta kicks off at 6 a.m. on Wednesday, when the first 300 shoppers who purchase groceries at the store will receive a free reusable bag loaded with groceries and goodies. Starting Wednesday and running through the weekend, guests may register to win prizes including Food City gift cards, gift baskets and home appliances. Special performances by Ballet Folklorico Quetzalli-AZ, Rascapetatiando Dance Co. and Mariachi Juvenil de Mi Tierra in the courtyard. Free admission, free parking. Scottsdale (map). ​In 2017: Friday, May 5 from 11 a.m. to 2 p.m.
At “Cinco de Hefe” the famous mini donkey "Pancho" will be on hand to pet and take pictures with. Food and drink deals including $6 Sauza Blue shots & drinks, $9 Patron Shots & drinks, and $200 Bottles of Patron until 9 p.m. 4425 N Saddlebag Trail, Scottsdale. ​In 2017: Friday, May 5 from noon to 2 a.m.
El Hefe and Dierks Bentley's Whiskey Row have teamed up to throw a block party in Tempe to celebrate Cinco de Mayo. Local DJ’s. Expect surprises! Drink specials include: $6 El Jimidor shots and drinks; $8 Don Julio Shots and drinks; $200 Bottles of Don Julio before 9 p.m.
C.A.S.A. will shut down the east side of 6th Street at 6th & Mill to throw a Cinco De Mayo party complete with DJs on the extended patio, tacos, tequila, buckets and more. Hosting a Cinco De Modern Block Party on May 5, 2017. Live entertainment, food and drinks specials, raffle prizes every hour, and fun backyard games like corn hole. The 21+ event costs $10 which includes admission and one raffle ticket. Table reservations start at $200. High Street, North Phoenix. Hosting their one One-Year Anniversary in conjunction with a Cinco De Mayo Celebration. Offering $2.50 mix and match taco deals, $2 taquitos, $6 frozen margaritas and $4 pints of Dos Equis. Live music. Free admission. Downtown Scottsdale. In 2017: Friday, May 5 from 4 p.m. to 2 a.m.
“Rock out” this Cinco de Mayo while enjoying ground beef, shrimp, pork, fish or chicken tacos served with a side of spicy mayo street corn for $10 per plate. Pair your tacos with a $5 margarita “Cinco De Drinko” special while jamming out to a live performance by The Corley Group from 7 p.m. to 2 a.m. with a CD release party for “Max V.” Happy hour specials will be offered from 3 to 7 p.m. and reverse happy hour from 10 p.m. to 2 a.m. Pre-sale tickets $20, tickets at the door will be $25. In 2017: Friday, May 5 from 5 p.m. to 2 a.m.
With over 50 different renowned tequilas, Aunt Chilada’s in Tempe is the perfect location to celebrate Cinco de Mayo! Featuring Roger Clyne’s Mexican Moonshine Tequila. DJ Torres from 5 p.m. 8 p.m. in the bar.Enjoy favorites in the dining room such as Street Tacos, Pollo Fundido and Chimichangas. Stay & play steps away at the Arizona Grand Resort & Spa with the Cinco de Mayo Package which includes: Deluxe accommodations, Chips & Guacamole plus two House Margaritas at Aunt Chilada's. Call for reservations 877.800.4888. Live events and specials with performances by PowerDrive, Arizona’s hottest dance band playing Latin favorites, Top 40 hits and Vive! Selena: A Tribute to Selena Quintanilla, a musical tribute to the life and sounds of the "Queen of Cumbia." In addition to musical performances, Casino Arizona will host a viewing party for the Canelo Alvarez-Julio Cesar Chavez Junior fight. The match up has unofficially been dubbed “The Battle of Mexico” and will be shown on the oversized screens in the casino’s Showroom. Food and drink specials including $5 Tecate, Dos Equis and Corona throughout the weekend and bead necklace giveaways on Friday and Saturday from 4 p.m. to 6 p.m.
Latino comics entertain. And maybe an Irish guy! Tempe Center for the Arts. In 2017: May 5 at 7:30 p.m.
Enchanted Island at Encanto Park will celebrate Cinco de Mayo with live entertainment at the park, including a Hispanic band and Ballet Folklorica, candy-filled piñatas for the kids. $10 special priced wristbands. In 2017: Sunday, May 7 from 11 a.m. to 8 p.m.
A family festival with live entertainment including nationally recognized musical performers, local band legends, ballet folklorico, boxing, kids zone, cultural food, family activities. Family-friendly entertainment. Tickets start at $15. Children 10 and under are admitted free. $5 tickets at the gate before 5 p.m., $10 after 5 p.m. Washington Street in Downtown Phoenix. In 2017: Sunday, May 7 from noon to 10 p.m. These restaurants/bars typically have parties and music to celebrate Cinco de Mayo. Call first! Sprinkles teams up with Casamigos Tequila to reinvent its classic Margarita cupcake! 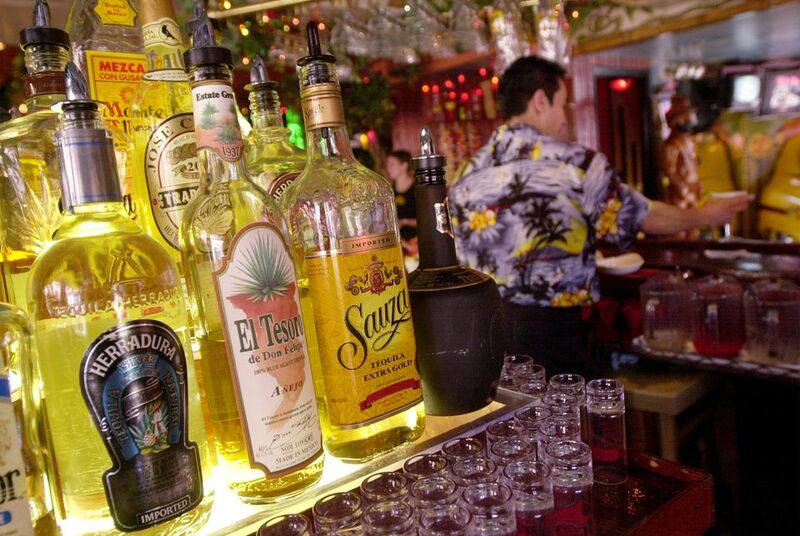 Whether on the rocks or straight up, tequila has long been one of the cornerstones of Mexican culture. Now, you can order a Casamigos Margarita at the Sprinkles Cantina. This key lime cake is loaded with Casamigos Blanco Tequila and topped with key lime frosting. George Clooney and Rande Gerber's award-winning Casamigos Tequila is a small batch ultra-premium tequila made from the finest, hand-selected 100% blue weber agaves, grown in the rich red clay soil of the highlands of Jalisco, Mexico. Sprinkles is located at 4501 N. Scottsdale Road, across from Scottsdale Fashion Square. To place an order, visit Sprinkles online or call 480-970-4321. 1. Build ingredients in a mixing glass and shake well. 2. Serve in a Margarita glass, of course. Do you know of another restaurant, bar or club that always has live music for Cinco de Mayo? Let me know, and I'll add it to the list.